The Blade CX2 from E-flite was one of the first ready to fly contra-rotating models to offer a controllable flying experience that made this type of heli a decent place to start for the beginner. The new CX3 is an updated model that includes a new control system and smart set of clothes. The original E-flite Blade CX that was released a few years ago offered heli beginners a great way into the hobby. 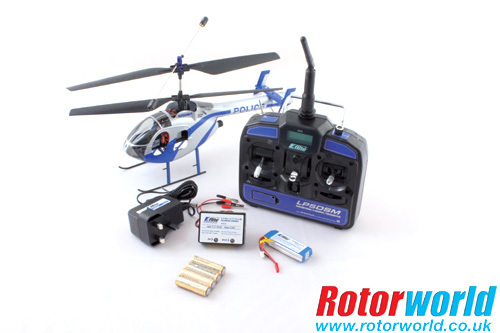 No prior flying experience was necessary and every model was factory flown and tested meaning purchasers could be safe in the knowledge that their first RC model helicopter would at least get off the ground and into a reasonably stable hover. Then came the CX2. The new member of the Blade family looked even better with its smart red fuselage, but best of all it featured Spektrum DSM 2.4GHz technology making it virtually interference free and even easier to fly straight out of the box. At first glance the main difference to the previous models is a new body set. Where the CX and CX2 had an edgy futuristic looking canopy, for the CX3 E-flite has opted for a more scale approach. 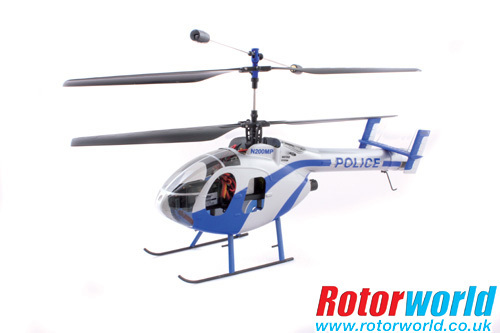 This certainly makes sense as the sort of customers looking for this type of machine are more likely to want a model helicopter that actually bears some resemblance to the real thing. As we’ve come to expect from E-flite, the moulding of the canopy is excellent and the material used is very good quality. Other changes to the specification include a new 3-in-1 control unit, a lightweight Spektrum AR6100e receiver and two tiny super sub-micro servos. The new control system is of particular interest as it now includes a heading lock gyro. It really was the combination of contra-rotating blades, 2.4GHz Spektrum radio and flight control system that made the CX2 so easy to fly and now the inclusion of a heading lock gyro should make the CX3 even better. The CX3 is an evolution of the CX range rather than a complete redesign which means it’s built on the same platform. This consists of a lightweight plastic chassis onto which the mechanicals and radio gear are bolted. There are many other contra-rotating models available that are built in a very similar way, but it’s the quality and attention to detail that separates the E-flite model from the rest. Its low weight and balance help to give it excellent flying characteristics and the quality of the plastic used gives it both rigidity and strength, but at the same time is pliable enough to withstand some knocks. As with other E-flite models, the CX3 is pretty easy to work on and so replacing any broken parts, or indeed upgrading existing components, is relatively straight forward. As with all the many other contra-rotating models available, the CX3 is aimed squarely at the beginner’s market. This area has now become very crowded as so many manufacturers have jumped on the ‘contra-rotating bandwagon’, but as with any growth area, the quality of models on offer varies wildly. Yes, most will fly and some are even quite controllable, but few will give the pilot any idea of what it’s like to fly a single rotor collective pitch machine. The CX3 on the other hand makes a pretty good fist of it. True, it can only really be flown indoors, or maybe outside on a very calm day, but the way the helicopter takes off, hovers and moves around is predictable, controllable and confidence inspiring. The contra-rotating blades coupled with the E-flite control system is what made the CX2 such as success and the addition of a heading lock gyro has take the control to another level. During out flight test I handed the transmitter to a compete heli novice who shall remain nameless (due to the fact that I might not get my dinner cooked or washing done) and they were able to lift off and hover the CX3 pretty easily. In fact it’s so stable that we were able to swap the transmitter over while the model was in the air and all within the confines of an average sized living room. I think you probably get the general idea. The CX3 flies well and will really flatter even the most newbie pilot. As you can probably tell from comments earlier in this review, I’m very impressed with the Blade CX3 and would have no hesitation in recommending it as an ideal beginner’s machine. There are similar models on the market that seem to start off okay, but quickly become disappointing and frustrating to use once the owner finds out that their new model not only breaks easily, but once it has, there are few spares and virtually no backup available. The addition of the heading lock gyro has taken what was an already accomplished design and polished it even further. 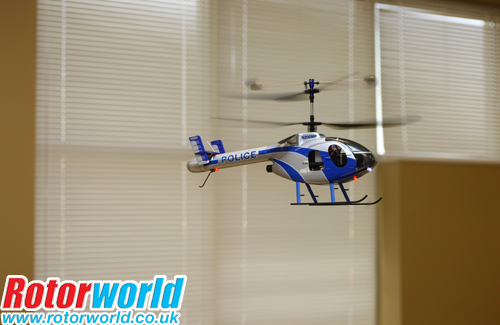 If you have a decent size indoor venue in which to fly it, this model certainly won’t disappoint. But one of the best things about the Blade is that it’s not just for beginners, more seasoned flyers will also enjoy having a buzz around with it. In fact it reminds we very much of it’s tiny brother the mCX which once again I’ve seen enjoyed being flown by both complete beginner’s and the more experienced alike. Sometimes contra-rotating models are looked down at a bit by experienced heli modellers, but with its superb scale looks and excellent flight characteristics the E-flite Blade CX3 could be the model to change those preconceptions. It’s a very good value for money package that comes highly recommended.